This is your friendly reminder that, if you’re Catholic in the United States, today is a Holy Day of Obligation. It’s All Saints’ Day (or Solemnity of All Saints), a day where Christians remember and honor those who are now in Heaven with Christ. When I was confirmed as a Catholic this year, I chose Mary, the mother of Jesus, as my patron saint. If you’re Catholic, do you have a special saint that you are drawn to? 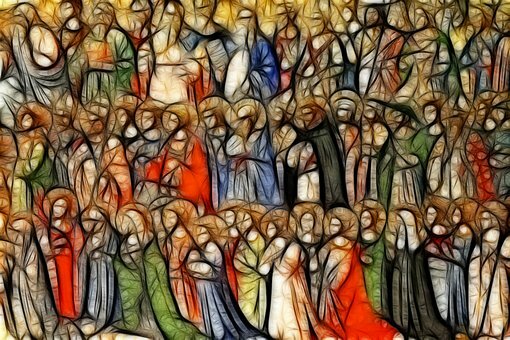 If you’re not a Catholic Christian, and aren’t familiar with the lives of the saints, is there someone who has served as your role model of faith? Maybe it’s your parents or grandparents. Or, maybe a close friend introduced you to the Christian walk. Either way, take time to pray and thank God for those who have drawn us closer to life with Jesus. Here’s the fun part of the story: to our knowledge, no Catholics have ever lived in the house, and it’s an old house. My dad’s family isn’t Catholic, and before that, my mom’s great-uncle and aunt lived there. They weren’t Catholic. There may have been an occasional Catholic sweetheart in-and-out of the house for visits when the place was rented. But, it’s farfetched s/he would have misplaced a Miraculous Medal that fell between the floorboards and a crevice where a water heater used to sit. Plus, before my mom cleaned it, the medal was caked thick with dirt, signifying it’s probable old age. She had to use a chemical to clean the medal just to see the image of Mary. You’re probably thinking, “OK, Sarah. What’s the big deal? People find misplaced items in old farm houses everyday.” I agree with you. I’ve found my share of horseshoes, old nails, and newspaper clippings inside and around my dad’s old childhood home. But, this find was different and brought comfort to my heart. For the past 18 days, I’ve participated in a 28-day rosary challenge with daily devotionals, courtesy of Chews Life. I’ve experienced an increase of grace and peace in my life, and human words aren’t necessarily able to explain this change. It’s truly God at work (that’s another post for another time). Finally, around the time I began the rosary challenge, I started wearing a free, miniature medal I requested from The Central Association of the Miraculous Medal. I’m not claiming that my mom finding the Miraculous Medal hidden deep in the floor of my dad’s childhood home is a miracle. But, I also believe there’s no such thing as coincidences: especially as today is All Saint’s Day, and the Blessed Mother is my confirmation saint. Sometimes, God winks at you in the most interesting of ways. Have a blessed day!